Durable canvas wallet with leather details. This men's wallet is sized just right to hold your passport. It's made of rugged canvas and reinforced with leather at the spine and around the edges. Six credit card pockets keep your important items organized and secure. I know this sounds like a weird-person cranky complaint, but this wallet is *musty*. Maybe it was sitting around a moist warehouse for a while, but it gives off a powerful musty odor--like having a wet basement in my pocket! Longest lasting wallet I have ever had. Made with the same materials and quality you would expect from Carhartt. I bought this for my son. He loves it. The whole deal is a good deal. This wallet is the best wallet I have ever had because I dress totally in Carhartt when I do manual labor, and it makes me feel complete and whole. I bought this wallet 2 years ago and it is still hanging in there. no rips or tears. i paid twice as much for my previous wallet and it only lasted 4 months. My title review speaks of my experience. I like the wallet; however, the stitching on the credit card pockets tore with little provocation. Yes, perhaps there were too many cards in the pockets but previous wallets were able to handle the same load. This one wasn't. I had expected better. It's great & looks good. Small but with enough space for everything you need & then some. It definitely appears high quality like everything Carhartt. I've only had it a couple weeks now so I can't say anything about it's durability over time but I hope it stands up to the name. I bought this wallet on a whim, I needed a new wallet and saw this at the Carhartt store. I’ve been using it for about month or so, seems durable. It sounds odd but I love the smell of it. I'm having a similar issue to that of another reviewer, however mine made it about 8 months. 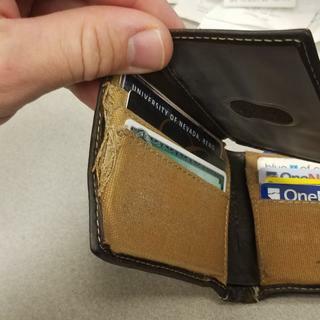 It's a great wallet for design and general use but the side seams unraveled causing to whole side to fall apart. This exposes your credit cards to the open where they can fall out. It's unfortunate seeing as how my 5-year old Carhartt winter jacket has held up amazing in farming/ranching conditions where it's truly abused. I received this wallet in camo as a gift from my wife two months ago and it is already unusable. In just two short months the front slot designed to hold credit cards has torn open at the seam causing me to lose one of my credit cards. The durability of this wallet is very poor. I could maybe understand if I was very rough on it but the thing sits in my bag 90% of the time and is only in my pocket on the weekends. I am very disappointed In carthartt for this one. Love my new wallet! Made with the same Canvas Duck material as my favorite Carhartt pants. Holds everything I need with room to spare. I got this wallet for my husband for his birthday and he loves it. It's durable, functional and is perfect for him. He loves the canvas material and seems like it will hold up well because this. Would recommend this wallet, good price and good buy for the quality. I bought this Wallet as a Gift for my boyfriend because he had used the same wallet since high school. (So over 6 years). The wallet is made from really nice material and reinforced with leather. He loves how soft the canvas part is and he also loves how it's not bulky in his pocket. Great wallet.. for a month. Fell apart. I own TONS of carhartt stuff. 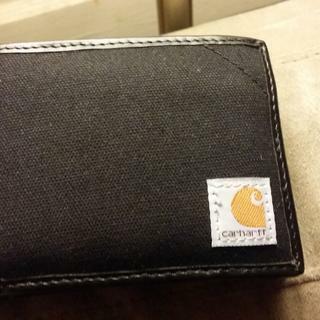 I bought this wallet thinking it was going to be good carhartt quality. WRONG! After just over a month, the seams started to seperate. I thought it was from all the money I had, then I realized I spent it all on carhartt. I taped the wallet together because it is a good wallet. It holds alot of stuff. I hope they get this issue figured out. We have contacted the customer regarding this complaint. Well built and designed. Durable canvas. I like the camouflage and all the room, but the durability didn't last a week. 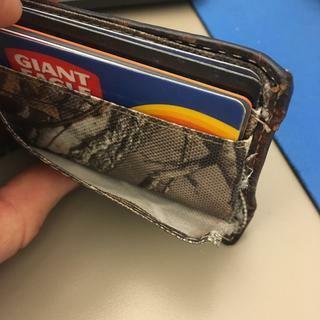 Where the camouflage lines the exterior of the wallet.It has started to separate from the sewin in carhartt leather. I work a lot of hours and I need clothing and other accessories to hold up,but this wallet cant. Carhartt has reached out to the customer to ensure satisfaction. Poor construction, fell apart in about 6 months. Nice and roomy. Credit card slots are plenty big enough unlike some others I've tried. Not too sure about durability as it is way too soon for that. Came apart at seems after short time of use. Comfortable and Functionally a great wallet. Love the looks, feel, and layout of this wallet. Sadly it began to separate at the inner seams after only two months of normal use (one month after the Carhartt warranty expired)....Go Figure!!!!!!! This wallet is the one that I have been looking for, for quite a while. It handles the contents in a secure manner with no bulge. Does it have a bill divider? BEST ANSWER: This style has a traditional bill fold for dollar bills. Does this have a pocket for paper money or is it just for cards? BEST ANSWER: Yes, it has a traditional pocket for paper dollars. Very good wallet, I've been using it for about 6 months. not too slim once you load it up with ID & credit cards, but I'm happy with it. It has a pocket divided for two different types of currency. Also nice slots for credit cards and a plastic flip sleeve for ID. Very nice feature. It does have a place for paper money. It opens up in the middle just like a bi-fold wallet should. Yes the wallet has a paper money compartment as well. Very well built, good value. It has two pockets for money, and card holders. Very good product! Yes there are actually 2 compartments for paper money. yes, there is a pocket with a divider. It has two pockets for money. What are the tabs in the billfold portion for? BEST ANSWER: It's for extra keys incase you lock yourself out of your house or car. I think they are rarely used anymore. Is there a change pocket? BEST ANSWER: There is no pocket that I would consider to be used specifically for change. Though there are two pockets that when the wallet is folded could certainly hold, not much, change. No, but there are two key holders for hidden keys. No there is no change pocket. BEST ANSWER: This wallet measures approximately 4 x 3 1/2". Well the dimensions are as follows. With the wallet closed flat on the ground, as if you were to view a rectangle. With the wallet open the dimensions are as follows. There is a flap on the left side that opens upward. That is enough to hold two cards. Or cash if desired.